Renowned for its fashion and trade fairs, Dusseldorf offers visitors vibrant nightlife and a wide range of shopping options. 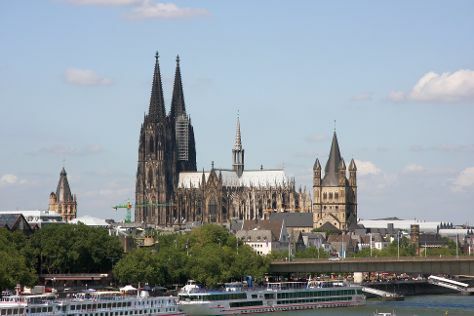 Change things up with these side-trips from Dusseldorf: Duisburg (Tiger & Turtle - Magic Mountain & Landschaftspark), Cologne (Botanical Gardens Flora, KolnTriangle, & more) and Aachen (Aachen Cathedral (Dom), Aachener Rathaus, & more). Pack the 8th (Wed) with family-friendly diversions at Phantasialand. The adventure continues: enjoy breathtaking views from Rhine Tower (Rheinturm), admire the striking features of MedienHafen, make a trip to Deutsches Eck (German Corner), and stop by Old Town (Altstadt). Inspirock's itinerary builder makes planning a Dusseldorf trip simple and quick. If you are flying in from India, the closest major airports are Düsseldorf Airport, Cologne Bonn Airport, Weeze Airport and Dortmund Airport. In August, daytime highs in Dusseldorf are 27°C, while nighttime lows are 15°C. Finish up your sightseeing early on the 18th (Sat) so you can travel back home.